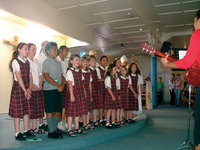 The core values of Our Lady of the Rosary School, Waiwhetu, were highlighted at its 75th Jubilee marked on 9 – 11 March. Principal Kathleen Daly said the event was a great celebration of the past and present. The weekend’s events included three days of mingling, reminiscing and celebration of Eucharist. The jubilee began with an initial ‘mix and mingle’ at the Petone Workingmen’s Club on the Friday night. The following day a joyous Eucharist celebration impacted all those who joined with Archbishop John Dew and concelebrants Fr Michael Steiller, Msgr John Broadbent, Frs Jim and Pat Dooley and Tom Sherry. Many Sisters of the Missions and of St Joseph of the Sacred Heart who staffed the school for many years were present and gratitude was extended to them for their dedication. A waiata sung by present students marked the occasion before the congregation headed to the school for a tree planting and cutting of the jubilee cake. Fr Michael believed that the jubilee would help pass on the school’s values to present and future students. The family support of the school was evident with a lunch organised solely by some parents of current students. A tour and power point presentation showed the many faces that have contributed to the school in various ways. A dinner was held on the Saturday night where guest speaker and parent of former students, Keith Quinn, gave an entertaining rendition of his life as a sports reporter. Many carried on the celebrations at the Sunday Mass at Our Lady of the Rosary Church. Jubilee coordinator, Sue Pye, was delighted with the way the past pupils came together and embraced the weekend to bring the emotions to the fore.